*cracks knuckles* This may be the most requested recipe ever. 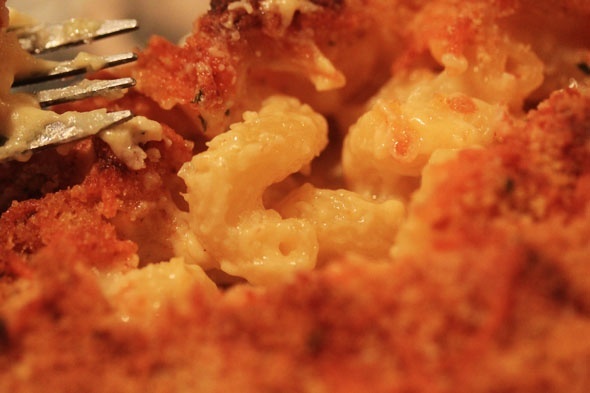 I kinda get why…not too many people hate macaroni and cheese. If you do, you might be a weirdo. 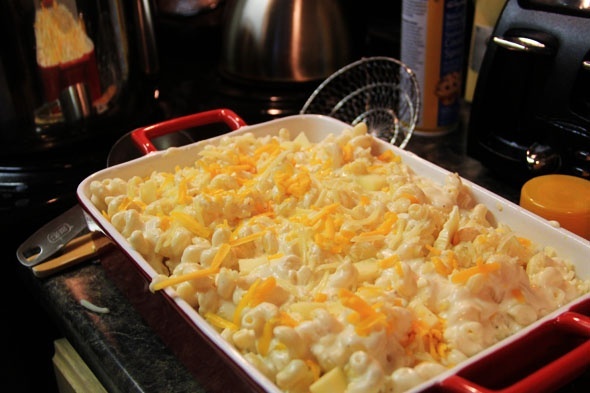 Macaroni and cheese is one of those dishes that seems super easy to make, but many people can’t get it right. I’ve had so many terrible versions made by others…super soggy overcooked pasta, clumpy bland cheese, dry and flavorless…the list goes on. I didn’t nail my own macaroni and cheese until maybe the 5th time I made it. It does take patience and practice, so don’t get frustrated if you don’t get it right the first time. It’s totally worth the effort to make again and again. 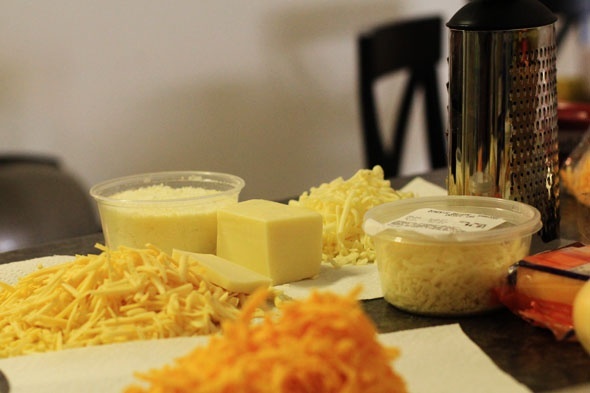 There are 3 distinct ways I prepare my macaroni and cheese. This is one of them. 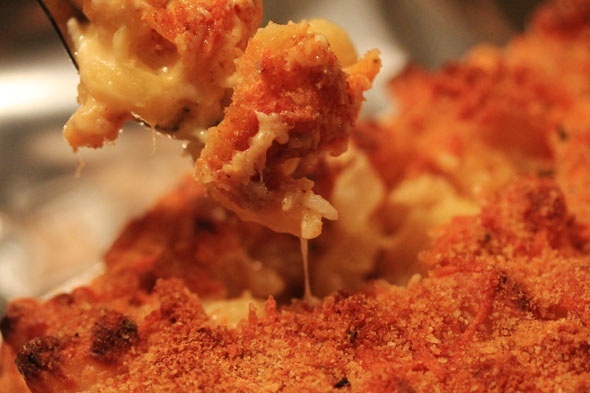 It’s the classic “béchamel (cheese sauce) + pasta + more cheese + breadcrumb” method. You can find this method just about everywhere, and I got my inspiration from watching Emeril Live back in the day. I saw him do it this way and it’s been my go-to method ever since, especially when I’m feeding more than 5 people. It’s super easy to do, but a little intimidating if you’re not used to cooking. My usual starting-5 cheeses are Cheddar (any variety), Gruyere, Parmigiano-Reggiano, Pecorino Romano, and Fontina. Those are my favorite cheeses because they all compliment each other extremely well, and melt together into this harmonious concoction of pure dairy lust. 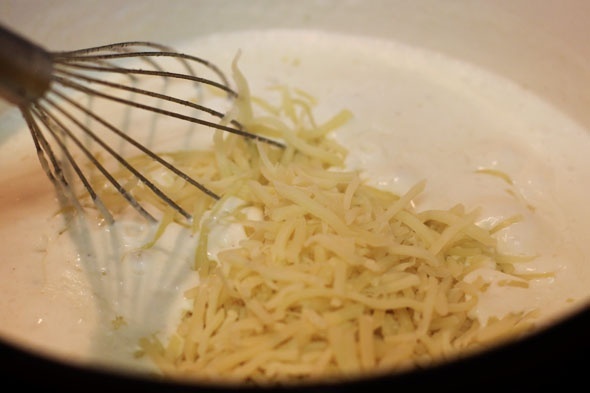 I love adding the Parmigiano-Reggiano and Pecorino-Romano to the béchamel sauce as a flavorful and slightly salty base, then tossing in the other cheeses with the coated pasta to be baked off. Sometimes I only use cheddar and smoked gouda, another delicious pair — especially during BBQ season. Smoked gouda isn’t very creamy on it’s own, so it absolutely needs to be paired with something and cheddar is always a great choice. Sometimes I only use fontina and gruyere — it really depends on what I’m craving. Colby-jack is another great cheese, but if you want dramatic stringy cheese action, try whole milk mozzarella, monterey-jack, provolone, etc. 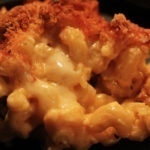 I encourage you to try different cheeses until you find a blend that best suits your ultimate mac-n-cheese experience. 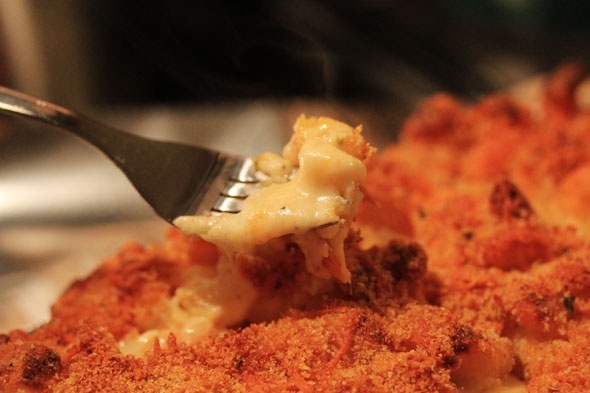 Bland mac-n-cheese is a no-no! Seasoning, where art thou? No matter what cheese you use, it needs a bit of help with some seasoning. Some cheese are very salty on their own, but that’s about it. 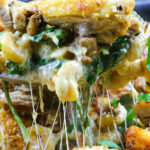 You really wanna think about the flavors that compliment cheese overall, and try to apply that to your mac-n-cheese dish. For example, when you order a pizza…the cheese tastes amazing with all of those contrasting flavors — onions, herbs, etc. I love adding shallots, garlic and bacon to a mac-n-cheese dish for a whole ‘nother level of cheesy epicness. You can really get creative and add crushed up onion rings to the top for a sweet oniony crunch on top…man, I’m telling you…mac-n-cheese can take on just about any flavor. Some folks throw in roasted tomatoes, or mushrooms and onions, Italian sausage, or spinach. Open your mind and your palate will thank you. My seasonings of choice are usually black or white pepper, kosher or sea salt, cayenne pepper, onion powder, granulated garlic, a tiny bit of nutmeg and sometimes dry mustard. I like to season the béchamel itself before adding the cheese — just go easy on the salt because cheese is already pretty salty. Once I toss everything together, I taste it again and adjust the seasoning as I need to. Taste as you go, and season every layer! 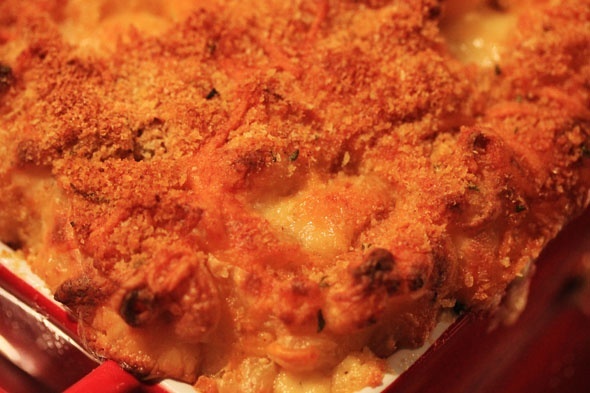 Totally optional, however, I love the crunch of Italian bread crumbs on top of my mac-n-cheese. 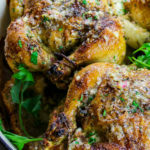 It creates a crusty barrier full of flavor that cannot be described. You can use fresh homemade bread crumbs, which I only do if I have white bread laying around — which isn’t often. Any variation is bound to be delicious. I almost always have Italian breadcrumbs on hand, so I mostly use that. Sometimes I’ll add panko (Japanese breadcrumbs) to the mix for an even bigger crunch, depends on how I’m feeling. 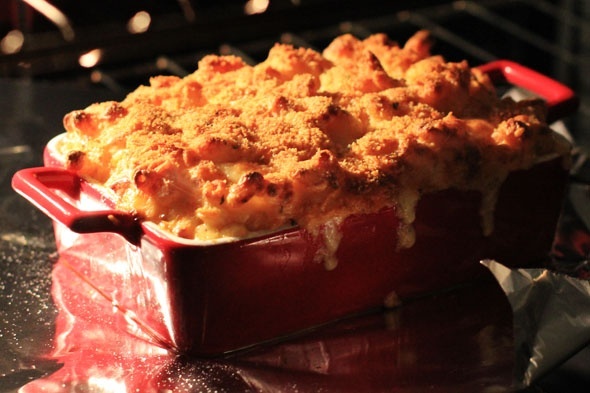 You don’t have to add breadcrumbs on top of your mac-n-cheese, but I promise you it’s delicious and it even helps keep the top layer of your dish from browning too quickly or burning. The breadcrumb barrier also keeps the entire dish moist, so you don’t have to worry about it drying out. 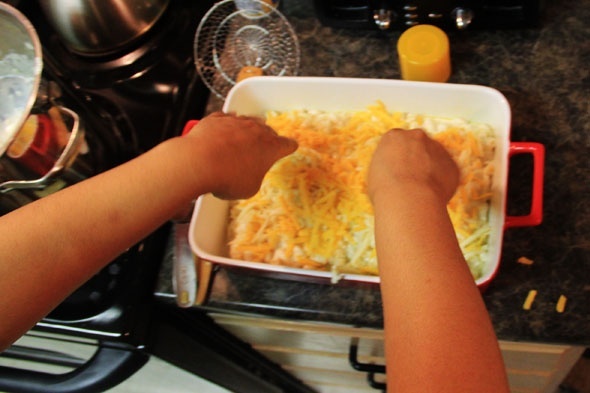 The oils from the cheese seep up to the top and help toast the breadcrumbs perfectly. It’s amazeballs, y’all. The more you make this, the more you’ll be able to gauge just how much of everything to use. I never measure when making this dish, I can just visually “eyeball” everything, but I’ve also been making it for years lol. 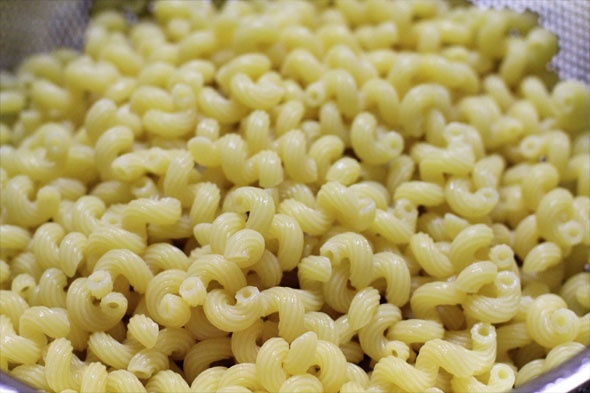 I drain my cavatappi pasta then rinse it with cool water to stop the cooking process. I don’t worry about removing any surface starches because I always reserve some pasta cooking water in case I need it later. taste it, season as you need to..
this makes a lot of mac! you could easily feed between 8-12 people. all done! time to eat! 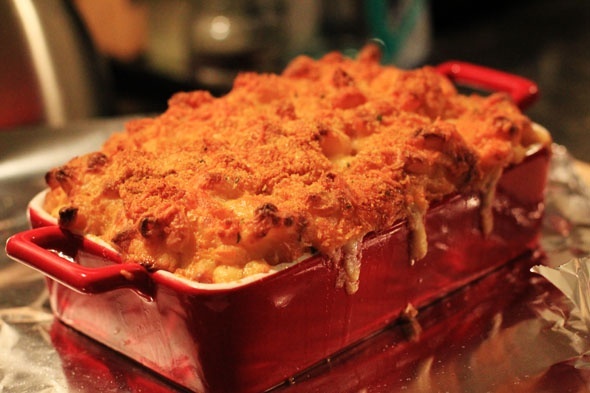 My very own version of the classic baked mac and cheese. 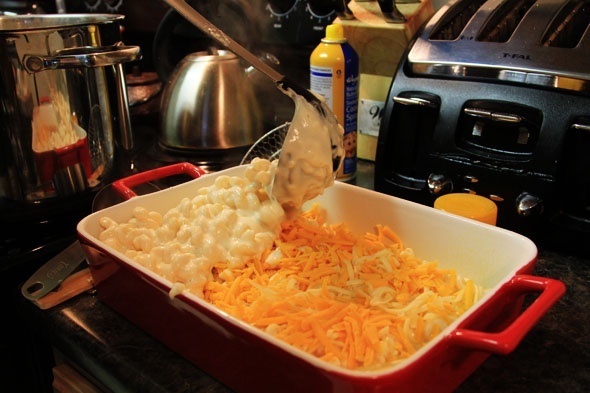 Butter a 9×13 or 8×11 baking dish and set to the side. You can use cooking spray instead. 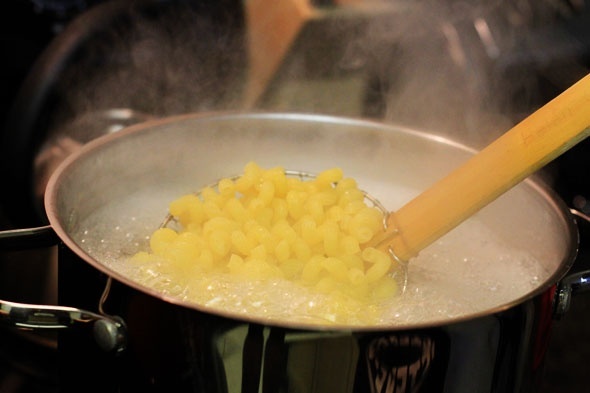 Boil your pasta in water seasoned with plenty of salt (about a tablespoon) for about 4 to 5 minutes. You want it undercooked because it will continue cooking in the oven when you bake it. 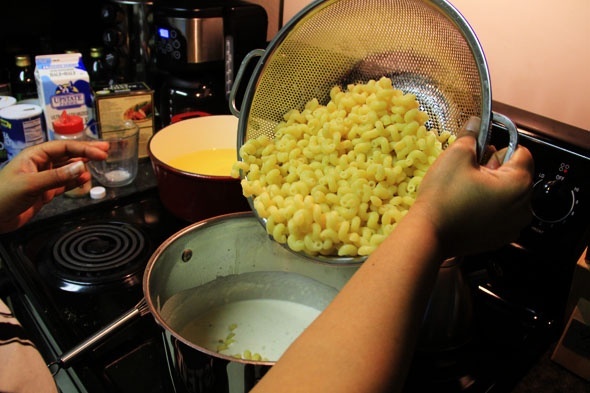 Reserve 1 cup of the pasta water and drain the macaroni and quickly rinse with cool water to stop the cooking process. Let it sit and drain while you make the cheese sauce. You may not need the reserved pasta water, but it’s good to have just in case your cheese mixture gets a little too thick and gloopy. In one heavy bottom pot or large sauce pan, melt the butter over medium heat. 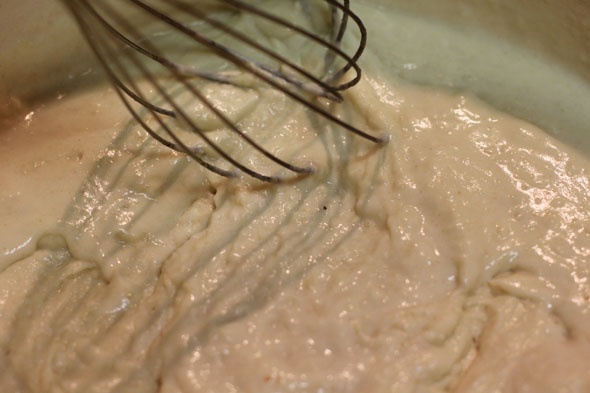 When it starts to foam and bubble, add the flour and immediately whisk so that it forms a paste. Allow this to cook for about 1 minute to get the “raw” flour taste out, whisking frequently. 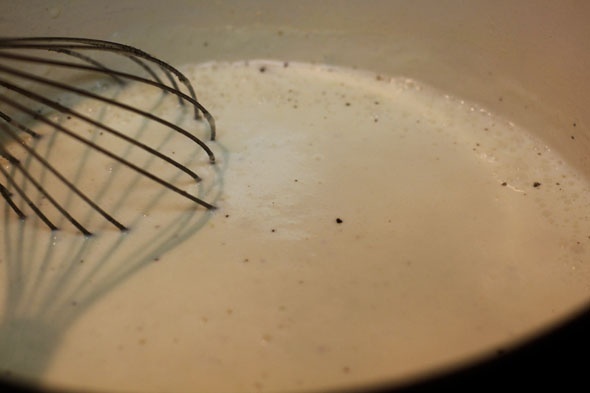 SLOWLY add 2 cups of the milk (or half & half) while whisking constantly to remove any large lumps. 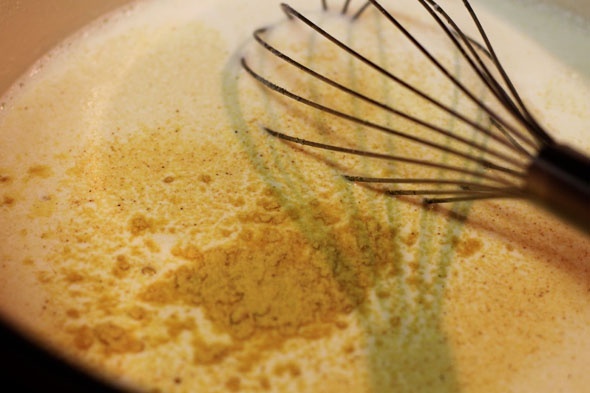 Continue to whisk until smooth and thick, about 20 seconds. 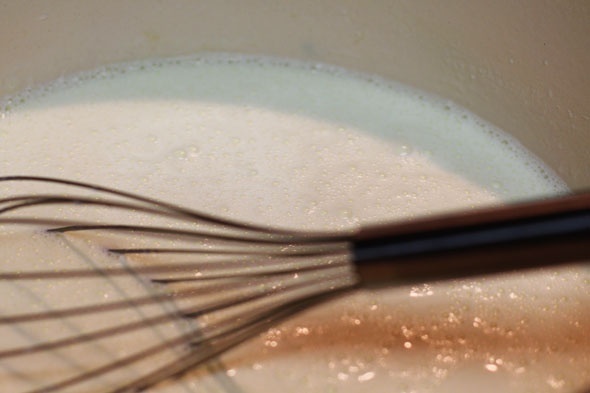 Add the remaining 2½ cups of milk (or half & half) and continue to whisk until smooth. Increase the heat to medium-high to allow the mixture to simmer and thicken, about 5 minutes. Season the mixture while it thickens and taste as you go. If the sauce is yummy alone, just imagine how incredible it will be once you add the cheese. Once your mixture is thick enough to coat the back of a spoon, add in the parmigiano-reggiano, pecorino and gruyere cheese and remove from the heat. Taste it again, season if you need to. Toss the cheese sauce with the pasta, and taste to season if need be. 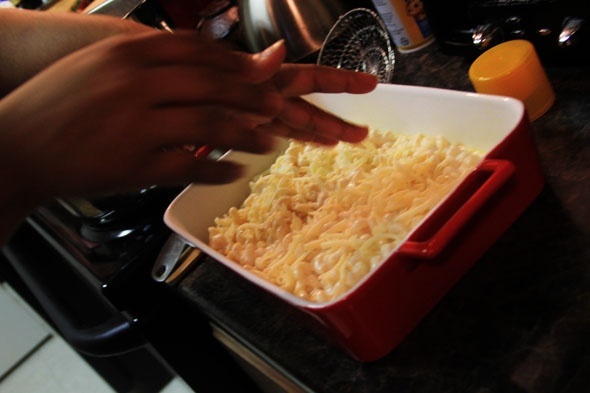 Don’t panic if there’s more sauce than pasta, you’re going to spoon it into the baking dish, so you’ll be able to control the cheese sauce/pasta ratio. As you’re layering, it’ll start to thicken up even more. On the flipside, if your mixture is too thick, add a bit of the reserved pasta water to the sauce coated pasta to thin it out. You want it smooth and creamy, but not incredibly soupy and watery. 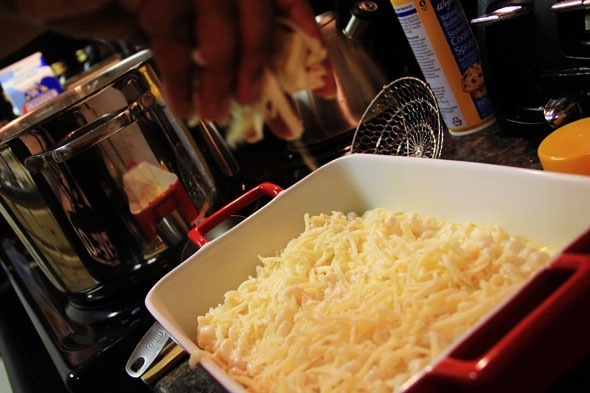 Ladle a layer of the coated pasta into your prepared baking dish, then sprinkle a layer of the remaining cheeses and repeat until all of the pasta and cheese is used up — lasagna style. This is where you can “eyeball” your cheese portions. Use more or less, it’s totally up to you. 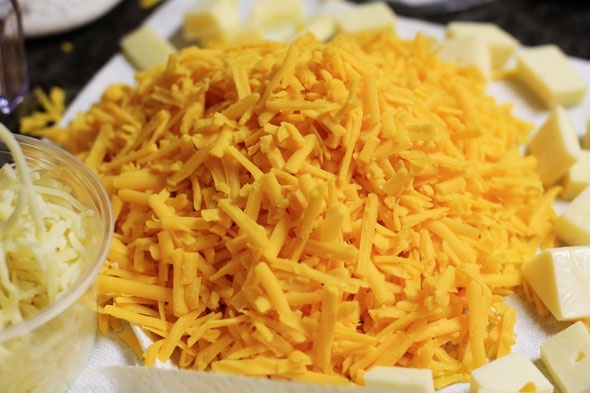 Too much cheese can be a problem because it’ll make it too oily and clumpy, so don’t go too nuts with the cheese. 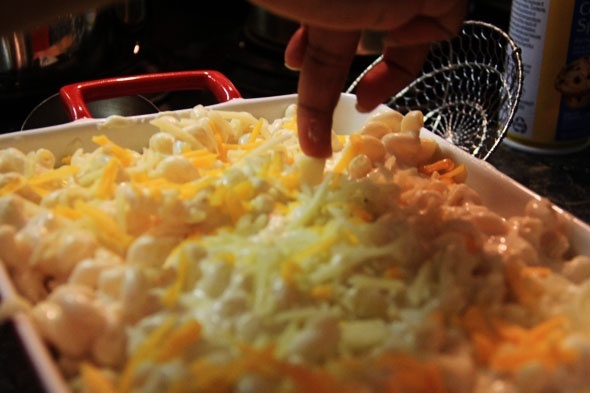 Run a spoon thru the entire mixture just to lightly mix in the cheese throughout the entire dish. Smooth the mixture with the back of a spoon just until its relatively even on top, and sprinkle a thin layer of seasoned bread crumbs on top for an amazing and tasty crunch, if you’d like. 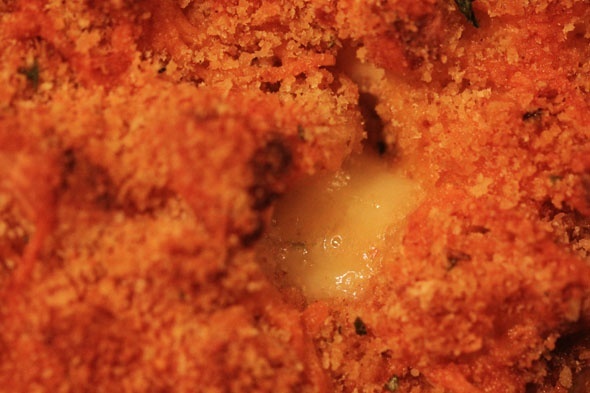 The breadcrumb crust also acts as a barrier to keep the cheese from drying out by helping to keep it moist. But again, you don’t have to use it if you don’t want to. Bake on the center rack of your oven for about 20 to 35 minutes or until the center is bubbly and the entire dish is golden brown. Let it cool for about 10 minutes before you dive into it. *You may or may not use ALL of the cheese measurements. 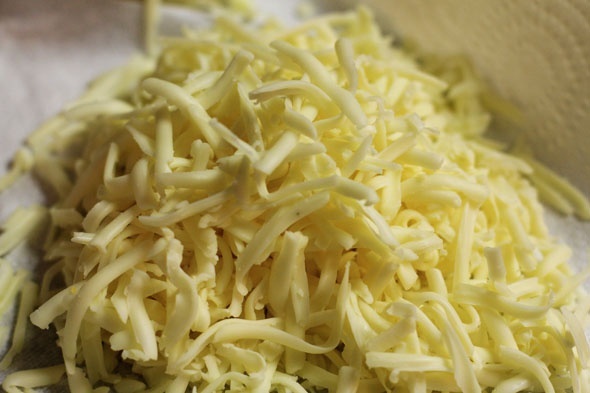 If you have any cheese leftover, seal it tightly in plastic wrap and store in the fridge for later use. 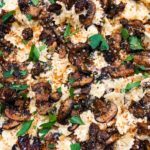 Alternately, you could add all of your cheeses to the white sauce and skip the “layering” method, it’s totally up to you. ***As far as choosing the right pasta goes, try sticking with the more traditional tubular shapes such as elbow, ziti, penne, cavatappi, capanelle, or something similar. Avoid pasta shapes that won’t hold onto the sauce well, like spaghetti or linguini, or even small shells in some cases. 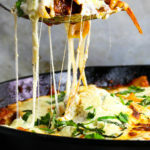 OMG i have been stalking this site, just WAITING for this recipe! I’m excited to try this one, and anxious to see the other versions! 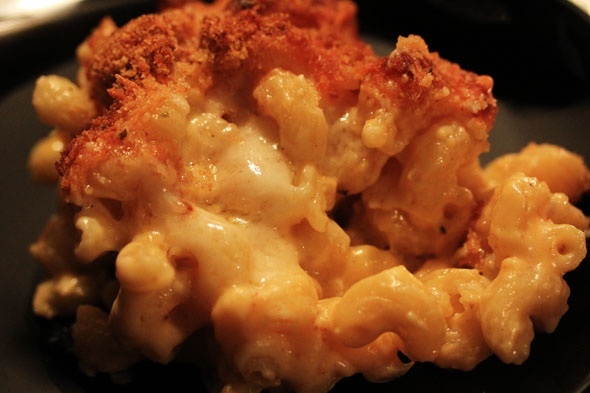 first of all, of all the mac and cheese I’ve had, mine has been pretty much the best, but I have to say THIS right here looks like a true contender and now I need to make that. I’ve tried a cheese sauce before -fail- so i just do it the old fashioned way. but I think this might be the move for Christmas. How many servings does this make? I usually only cook for myself, so I need to cut the recipe. Thanks! Outstanding. I’m gonna try this recipe for Christmas. My family thanks you in advance. try Walmart, i heard they sell domestic brands of those cheeses. First off love this site! Quick question, I’m new to this cooking thing and I love mac n cheese. 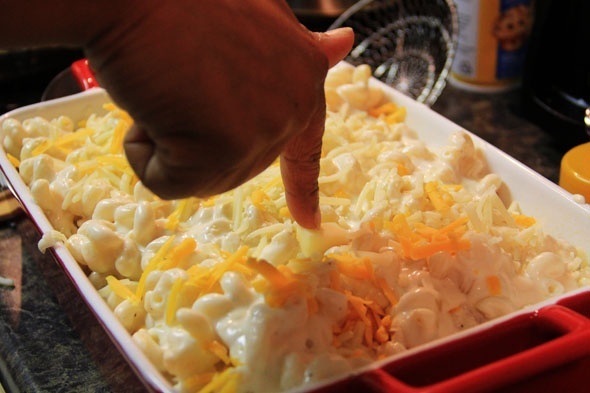 If I wanted to, could I let the macaroni marinate in the cheese sauce for a couple of hours before baking? Or is that no bueno? I wouldn’t recommend that at all. You’ll have seriously overdone noodles that could possibly turn to pure mush. Pasta is made up of flours and meals, so it can’t marinate the same way you’d marinate a piece of meat that has fibers and an actual molecular structure. Ohhh, I see. Don’t want overdone noodles. Thanks! i use 1 lb., which is one box. the only time i use more than one box is for thanksgiving or any super large gathering. oh ok great…and the size of your baking dish? 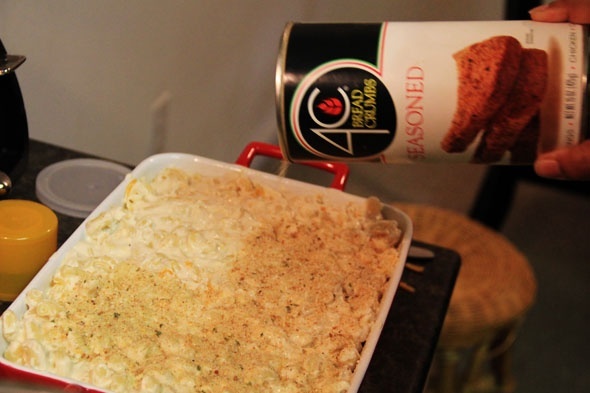 b/c an aluminum pan could work just as great too right? i typically use either a 9×11 or 9×13 if i’m using one whole box of pasta. an aluminum pan can work too, i use those for thanksgiving. just make sure it’s big enough for your mixture but not TOO big because then you’ll have too thin a layer of mac n cheese. I’m going to try this over the weekend! I’m hoping it works out. Fingers crossed! OMG I tasted this before I put it in the oven and it was perfect! I seriously didn’t want to wait for it to finish cooking. Also, I used 2% lactose-free, because I don’t buy regular milk. Anyway, the beschamel sauce smelled amazing! I never thought of layering, but i can definitely tell the difference! Everyone loved it, so I love you for this gift that you’re sharing! How do you feel about roomkaas and gruyere combined? I know nothing about cheese so I have no idea what cheeses compliment each other. This is the second thing I’ve conquered on this site which has now been bookmarked and saved to my favorite. : ) I read everything and even compared pictures as I went along since it was my first time making a roux, and I didn’t get it right til the second try, and it ended up being a little spicy because I put a whole tsp if cayenne pepper by accident, I’m a novice cook at best. But man oh man when I finished, it was hands down the best macaroni and cheese EVER!!! As told to me by my guests and the empty dish. Thank you!! Best Christmas ever! Tried this over the weekend, using half and half. Hella tasty. Seasoning the béchamel was key and next time I might go easy on the cheese (well I was using cheese blends). Do know one thing, if I made this for a date, I’m getting proposed like Chrissy did to Jim Jones haha. This was a new way of making Macaroni & Cheese for me. I was a little nervous about it but there was only a corner left so I guess it turned out good. Can’t wait to try it again! 🙂 yes, make it over and over and watch how amazing it tastes each time! Amazing. I used one your previous mac-n-cheese recipes and had good results. This recipe was simply amazing. Buttering the pan, using milk instead of half and half because of reheating, gruyere and fontina, the dry mustard and garlic, layering. All of these differences came together and I feel like I can whip out some mac-n-cheese like a pro now. I’ve always been intimidated because so many come out dry or too oily. It was perfect and the flavor is divine. I’m honestly surprised I had enough left to bake, as the sauce and pasta alone were so good I consumed my goddamn body weight. I added a half a teaspoon of cajun creole seasoning, because I’m obsessed with it, and it made such a subtle yet life-changing difference. LMAO! HAHA 😀 Glad you enjoyed ! oh no 🙁 well, i’m betting on your oven temperature being wonky…because even at 350 it should be bubbling by 30 minutes.. and it’s possible you could have used too many bread crumbs. it should be a super thin layer so that the oils from the cheese below seep into the crumbs and toast them without having to add more fat. but if you used too thick a layer, it won’t soak up as much residual oil and therefore remain dry. and what size dish did you bake this in? all of these are possible factors. THAT’S IT, Reesha – I put too many damn bread crumbs. I put a pretty thick layer on top. Whoops! I know for next time. I baked it in an 8×8 dish because I cut the recipe in half. It’s just me so I didn’t want to have too much. I ended up adding a little more cheese on the top to make it less bread-crumby. Everything else was perfect. 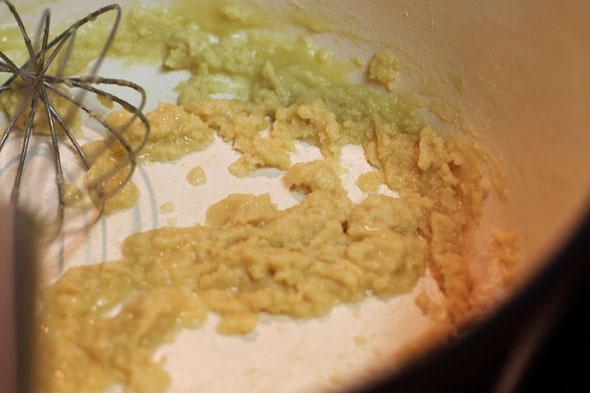 I’ve tried a roux before and it always had clumps which in turn made my Mac n Cheese taste like FLOUR. Your step-by-step instructions really helped. Thanks!!! ahhh ok good, glad we figured it out 😉 and it’s no problem! I used your technique today and the mac and cheese was divine. My 7 year old picky eater had three servings! I used regular cheese (mild /sharp/parm/Romano) because I didn’t have to go to the marker (newborn :-). I will use the exact ingredients as soon as I can get to the market. Thank you very much. I have been trying to master mac and cheese for a while and I can tell I’m almost there. Hi! 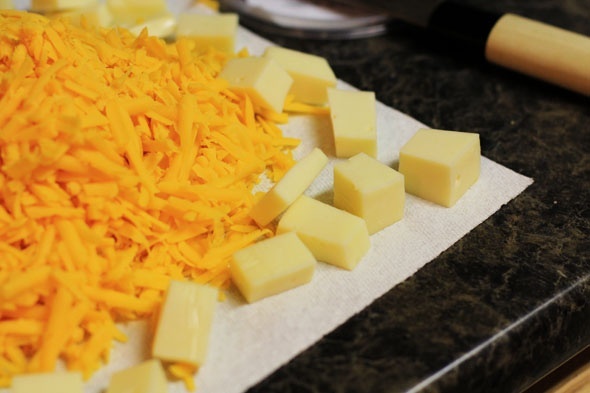 Generally, I’ll use sharp and mild cheddar, colby jack, mozzarella and muenster cheeses for my mac and cheese. In an effort to try something different, I decided to buy asiago, gouda, monterey jack and cheddar cheeses. How do you think all of these cheeses will fare together? that sounds amazing, give it a go! I am a lover of mac n cheese. 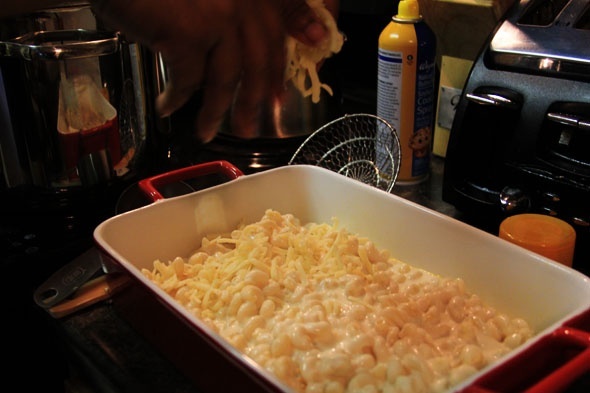 I’ve been searching for the proper soul food mac n cheese recipe. Can’t wait to try this. Too many bland recipes out there. Question though….Why do you do the layering as opposed to mixing it all? Do you notice the difference? Just curious. Love the idea for the cubed fontina. i love layering because i love the way it all melts together but you do not have to do that at all. it’s just my personal preference, you can mix it all around however you’d like. 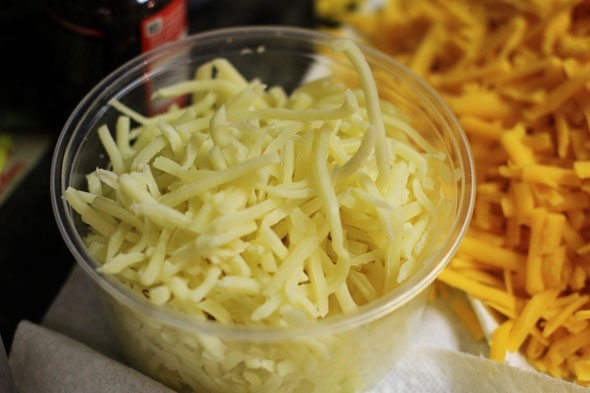 you can cube any stringy cheese and stick it in the dish. my other fav is low-moisture mozzarella. gives you dramatic cheese action. mmm! (1) Did you buy the cheeses pre-shredded or did you do it yourself? (2) I’m going to do this for Thanksgiving and it’ll probably be like 20 people when its all said and done; do I literally double every measurement? Thanks and…CANNOT. WAIT. TO. EAT. 1. i always shred the cheese myself. it’s extra work, but its worth it. the store-bought pre-shredded cheese doesn’t hold a candle. if you don’t have a cheese grater at home, get the people in the deli department of your store to do it for you. they’ll be happy to. 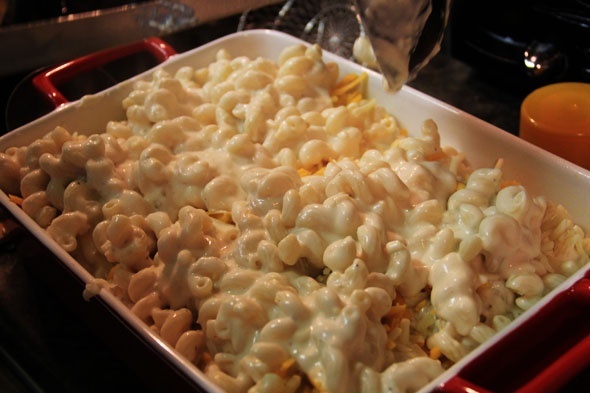 2. i’ve made this recipe for thanksgiving plenty of times, serving about 20 people, and the only thing i did was increase the milk to 5 cups instead (sometimes 5 1/2) of 4 1/2, and use 1 1/2 box of macaroni instead of just one box, and i added an extra cup of cheese (any will do). 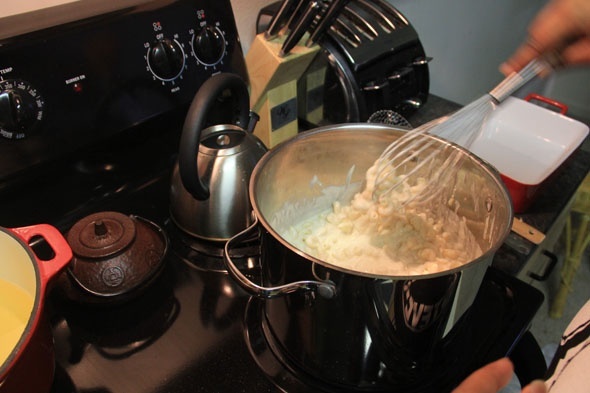 you don’t have to double everything, but keep some of the starchy pasta water on hand just in case things get gloopy or dry when you’re mixing everything together (which can happen). you want a smooth sauce, not a chunky one. Your recipe looks fabulous! 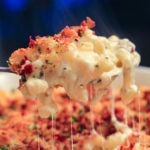 I am trying to replicate a Mac n Cheese that I had at a restaurant last week that used Smoked Gouda and Fontina cheeses. Using your recipe, what measurements do you think I should use for each cheese? Would you recommend adding any other cheeses? Thanks! Hi. 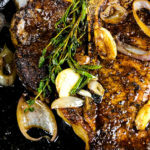 Planning on making this dish and was wondering if I can use margerine in place of butter? Is it okay to use evaporated milk in the can instead of milk or half and half? No, it won’t come out the same at all. Hey. Nice recipe. Around how much does it cost to make it ?? Thanks. It really depends on where you shop. Cheese isn’t cheap though, so you’d probably spend between $20-$30 just on that. However, it feeds a lot of people, so it evens out. 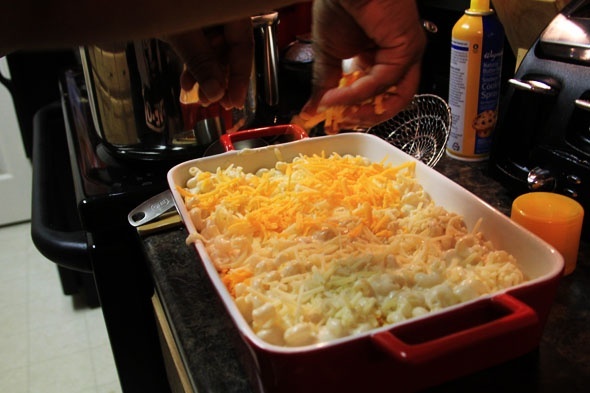 Hi Resha is it ok to prep the Mac and cheese and then bake it the next day or will it dry out? at it doesn’t cook the outside and not the inside. Is this dish freezer friendly? If so I freeze it before baking in the oven or after? And if it is freezer friendly what are the reheating instructions? Would I bake from frozen or bring it to room temperature first? Also, I quite fancy muenster cheese in my mac & cheese do, so do you think it would be a good idea to add it with your group of cheeses? Would it mix well? Lastly, what would be your measurements for heavy cream only versus milk or half-and-half? 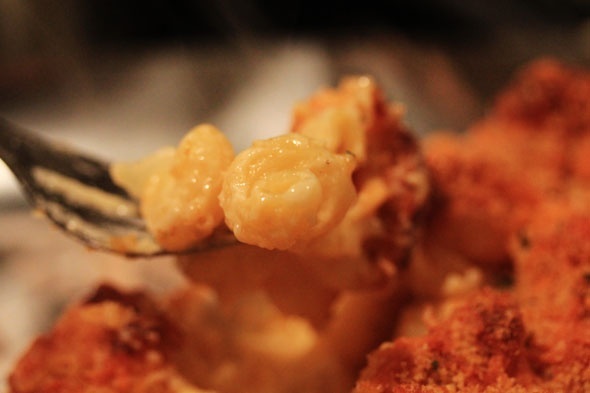 I have been disappointed time and time again by homemade mac and cheese recipes. This one, though, looks like it might just work. Most recipes I’ve tried have the cheddar melted into the sauce, which always turns out grainy and disgusting. 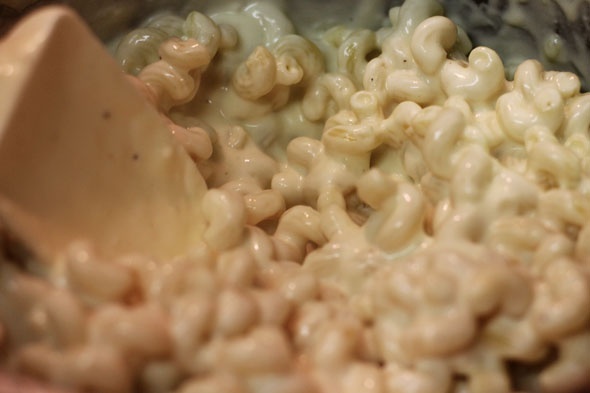 I like a good creamy, smooth and flavorful mac and cheese. Can’t wait to try this! Any suggestions for how to keep the dish from solidifying if i’m serving two hours after its been out of the oven? Try your BEST to keep it warm. It’ll absolutely get cold(er) if its sitting out two hours later. 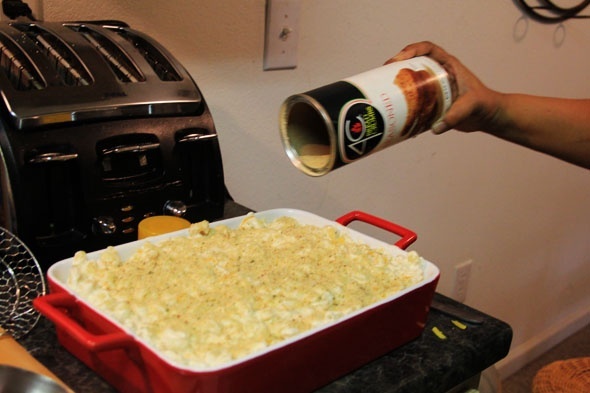 I tried this for thanksgiving and it was a big hit!! What’s the best way to reheat and have the cheese remain creamy? Should I add anything? Question: Whats the best way to reheat the leftovers without drying it out? Should I add more of the leftover pasta water? I haven’t experienced dry leftovers of this once it’s been reheated. if using a microwave, my suggestion to you is to make sure you warm it on 50% heat instead of 100, and don’t zap it for too long and fry it out lol — test the texture every 30 seconds. if you’re reheating in the OVEN, let it come to room temperature then put it in a 300 degree oven until it starts to melt again. you could use pasta water for the oven, or the microwave, but you shouldn’t need too much. a little moisture never hurt anyone, but that quantity would depend on how much is leftover, what you’re reheating it on/in, things like that. Made this for Thanksgiving and it was a hit! Thank you for this fabulous and tasty recipe!! —I burned the bottom of the Mac probably because I used glass and the bottom oven rack? This is the very Best of the Best. Simply Heaven. Also what are your thoughts on adding adding an egg to the béchamel. There’s a few recipes out there that call for it, but I haven’t noticed a difference in flavor. I do like adding egg if only because I always have someone stop and watch me temper it, trying to figure out what exactly I’m doing. lol. Just tried making this today for a party. It was absolutely divine!!! 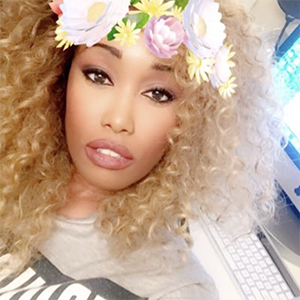 Thanks for sharing with us, Resha. I want to make it for a potluck. how was it heated? Hey girl, short story I remember following you from Tumblr!!! Not only did you get me into cooking but also Big Krit! Then I deleted my Tumblr account and I couldn’t find you on any other social media until Kid Fury shouted you out on snapchat! lol Anyway, I’m planning on using a few of your recipes to make dinner for myself and my boyfriend, however we definitely don’t need 10 servings. So, if I wanting to cut the serving in half to maybe just 4-5 would I simply just cut the ingredients in half too? This may be a dumb question but I’m definitely not a pro in the kitchen just yet, and this calls for so many ingredients so I have to double check wit you lol. Made this for Christmas last year and it was LIT!!! The fam wants me to make it for Thanksgiving! Hey I noticed you removed the old video from your youtube. Do plan on re-creating it? Please say yes!!!!! Thanks for the recipe and all the great pictures and tips! 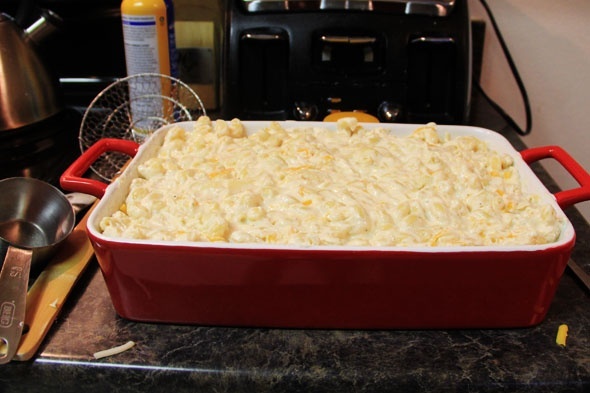 I’m working on a Mac and cheese recipe for thanksgiving tomorrow and I plan to model some of your recipe! I’ll let you know how it comes out! I’ve made this every year since you posted on Twitter. There’s never enough so I’m gonna try my hand at doubling the recipe tomorrow! thanks again for changing my life. I’ll let you know if it gets me married. Thank you so much for putting all your recipes on here. You’re amazing :-). 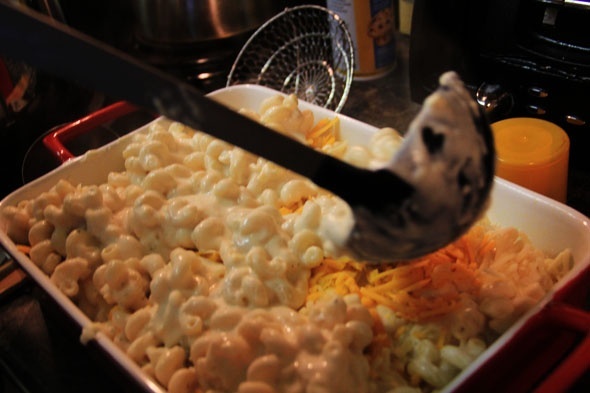 Quick question – I made the mac and cheese and although the flavors were out of this world – the macaroni was not cremey (if that makes sense). The cheese was grainy around the pasta. Did I over bake it? It was very cheesy before i put it in the oven – so i was a bit confused. Thanks! you probably need to add more pasta water to thin out the consistency and make sure you’re using the exact cheese measurements provided. the more cheese you add, the more gloopy it can get. Can half and half be used instead of milk? I also loved what you said about being self-taught, although you would love to go to culinary school! 🙂 I’m learning the world of cooking right now, and I love all your commentary that goes along with the recipe. I’m looking forward to making this Thursday. Thank you! Lord have mercy! This recipe is so good my tongue reached up and slap my brain!! Next time around I might have to add a little wine to the recipe, because what goes better with cheese? Wine….. I have been following basically this recipe for years as did my mother be fore me. Recently I made it and it turned out perfect. Today is my daughter’s birthday and this has been her favorite dish for years. When I made the sauce today it separated and “curdled.” This has never happened. What went wrong? This is my go-to recipe! wanted to try the smoked Gouda and cheddar cheese this year. What do I️ have to do different in the recipe? Doubled the recipe to make some for the family and for work. RAVE reviews! Thank you! I absolutely adore this recipe. I’ve made it the past two holidays and I’m about to make it again. But I need to prep everything beforehand to have it the day after. What do you recommend I do? Last year I prepped everything the night before and didn’t bake it. Put in the fridge, and the next day I baked it halfway at my moms, then an hour drive later, I baked it the rest of the way at my cousin’s which was where we were going to eat it. I guess it was fine but do you have any suggestions or advice on what to do if I have to prep and serve the day after?!!?! Thanks!! !